Fri, Aug 10, 2018, 09:55 pm SL Time, ColomboPage News Desk, Sri Lanka. 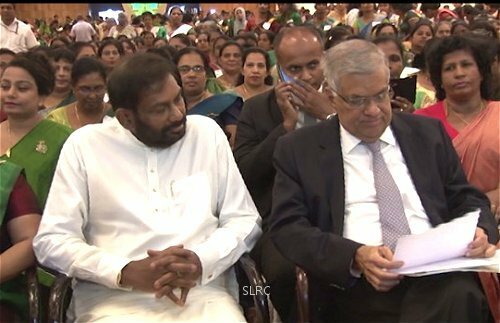 Aug 10, Colombo: Sri Lanka's Prime Minister Ranil Wickremesinghe today launched a program to empower women socially, economically, and politically and aspire them to contribute to the development drive of the country. A workshop was held at Temple Trees under the patronage of the Prime Minister to educate about 2,000 women on the Dhanabhimani Program organized by the Ministry of Social Empowerment and Primary Industries. Speaking at the occasion, the Prime Minister said the unity government headed by President Maithripala Sirisena has delivered more for women in 3 years than any government before it. "Not a single Government before us took initiatives to strengthen women. Our plans have empowered women politically, economically by supporting women in business, and socially by supporting women in need," the Premier said. Observing that the contribution made by women to the national economy is enormous, the Prime Minister said a majority of the population in the country are women, but if they are not strengthened at the grass root level it is of no use talking about the national or provincial council level. The Prime Minister said that their intention in the next few years is to strengthen the women at the grass root level. "As a result of the 25 percent women's representation introduced in local government bodies, women at grass-root level now have the opportunity to come forward as leaders," he pointed out. The Premier said women will be given the leadership at the economic activities in every format and attention will be drawn to their problems whether they are from the North or South. He expressed confidence that women would take the lead in the political and economic fields in the next few years. A major expectation of the Dhanabhimani Program is to elevate rural women entrepreneurs to the export level in order to double Sri Lanka's export earnings by 2020. The program intends to strengthen the family economy by directing the women for various enterprises programs such as self-employment. Many projects including fruit cultivation, livestock, mushroom cultivation, ornamental fish cultivation have been implemented. Loan assistance is being given under this program to improve the women-operated small and medium scale industries. The Dhanabhimani Program also aims to educate rural women leaders in order to solicit the contribution of rural women to the production task through rural women leaders. Ministers Daya Gamage, Chandrani Bandara and Deputy Minister Anoma Gamage were among those present at the occasion.